This cowboy Pooh Bear cake was made for a friends 40th birthday. I started off with 2 9 inch round cakes. I iced them with a butter cream icing. 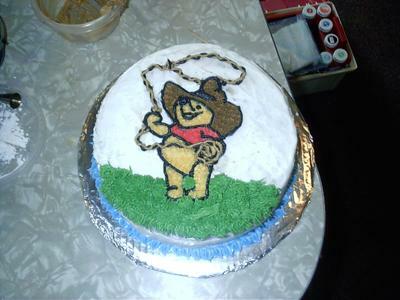 Once icing set (about 15 minutes), I took a black and white copy of Pooh Bear with cowboy hat, which I printed on tracing paper, and placed it on the cake, slightly off center(towards bottom). Afterwords, I had a very light outline of Pooh Bear. I colored a 1/4 cup of butter cream icing Pooh Bear Gold. I used a number 16 tip to fill in the body of Pooh Bear. I colored a 1/4 cup of butter cream icing Pooh Bear red for the hat, again using a number 16 tip to fill in the area. I colored a 1/4 cup butter cream icing Wilton coal black,I used a number 3 tip for the outlines, rope and eyes. I colored a 1/4 cup of icing brown for the hat. I, again used a number 16 tip to fill in the area. For the grass i ended up using to different shades of green to get the color i was looking for, they were: Pooh Bear green and kelly green. I started off with the Pooh Bear green and then added the kelly green until I got the desired shade. I used a number 133 tip for the grass effect. For the outline of the base I used a number 21 tip with blue butter cream icing. Very cute! You did a good job!